September 1st Update: Chugging along! August 1 Update: The rest of the game is the focus! July 16 Update: Is that a demo over there I see? July 1st Update: Two weeks = demo delivery! Hey guys, the last couple of weeks have been a bit slow due to some issues we ran into code wise. Please don't take that in a negative light, it's part of the process as you can imagine. Things are coming along though and we've got some cool stuff to show you very soon! Scott has been busted tail to get narrative stuff into the game, which includes the demo that will eventually get updated as well! Stay tuned for more interesting news in the next update! Hey guys! Kind of a short update today because the team is still working on most of the same things they were working on in the last update. We have a new narrative editor that was completed last week which is being used to make things way easier when getting the text in the game. Mark and the rest of the art team are hard at work in getting scenes completed for the full game. Trust me when I say, things are really looking amazing and lives up to the standards that he has set for himself in the past. I'll be posting something for you on this soon! The development team have been hard at work rewriting some of the code for our event driven system that we are using in Unity(our game engine) to make life easier behind the scenes of the game. We are still planning to put out a more polished version of the demo as soon as the underlying code is where it needs to be. So we hope everyone enjoyed playing the SpaceVenture demo! We really appreciate all the feedback you guys gave us over at the SpaceQuest.net forums! If you somehow managed to miss the release of the demo all together, CLICK HERE to see the update on that. SO WHAT'S BEEN HAPPENING THE LAST COUPLE OF WEEKS? 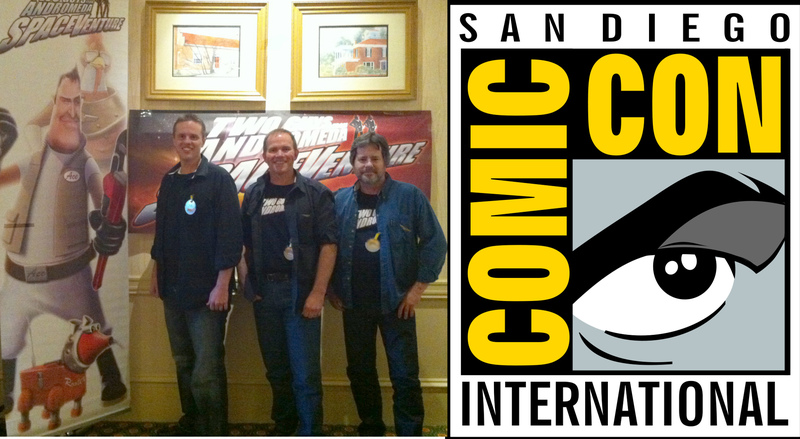 Mark Crowe, Scott Murphy and myself(Chris Pope) all had a great time showing off the demo to people at SDCC 2013. Lots of Space Quest fans came by our table that were crazy excited to meet up and get their hands on the demo right there at the convention center. We even found Roger Wilco.. ASLEEP, AGAIN!!! Lori and Corey Cole(creators of the Quest for Glory series) even dropped by and had very nice things to say about what they saw with the demo. SO NOW THAT THE DEMO IS OUT, WHAT'S THE PLAN? We will continue to make some updates to the demo, there is still a lot we'd like to do to it(more narrative, VO, and bug fixes), but I'll be honest here, most everyone on the team is focused on the game as a whole. There will still be bug fixes and polish coming out on the demo but we hope everyone is supportive of the fact that you guys kickstarted a full game, and that's what we are going to give you, but in order to do that, priority has to go to getting towards that finish line. When we update the demo, we'll let everyone know. One of the big things the team is focused on right now is getting the narrative editor for the rest of the game functioning to a higher standard. We weren't happy with the amount of work it took in order to actually get text on the screen which is one of the reasons the demo didn't have all of the narrative it should have had. Things are looking good on that front! Be sure to include a resume! PLEASE SUPPORT JIM WALL'S(MAKER OF POLICE QUEST) KICKSTARTER! WARNING: Make sure you are very much aware that this is a work in progress. 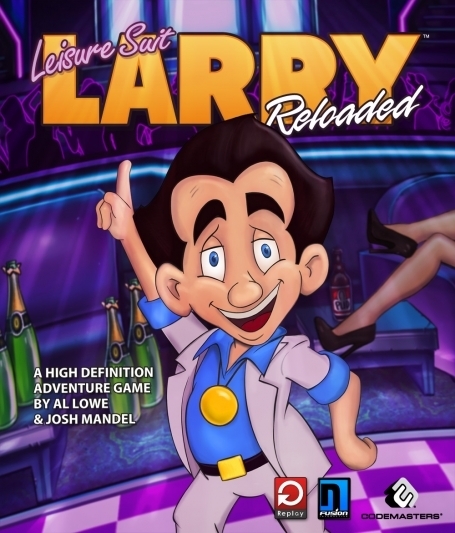 You wanted to be part of the development of the game. Well here you go, a developer build that features a small part of SpaceVenture itself. The demo is still in beta stage(Developer Build) as we haven't got all the bugs worked out just yet. Currently the demo has no Voice Over. That is still in the works. Not all the narrative dialogue is in the demo. All death sequences have not been included yet. Not every icon you see is usable yet as some of the icons are meant for the actual game and not the demo. ALL DEMO DISCUSSION(NOT KICKSTARTER) WILL TAKE PLACE AT SPACEQUEST.NET(The official Guys From Andromeda Forums) CLICK HERE TO GO THERE The best way to communicate with us and the developers is there! JIM WALLS(MAKER OF POLICE QUEST) IS MAKING A NEW GAME! Trust me when I say, nothing more would make me happier than to be giving you link info to download the SpaceVenture playable demo today, but unfortunately we'll need a little more time. How much time you ask? THE HEAT IS ON TO GET THIS THING OUT! This is gonna be happening in one of the upcoming updates as well, be on the look out! Emails have already been sent out. IF YOU HAVE ALREADY EMAILED US ABOUT THIS, WE ARE WORKING ON IT! NO NEED TO EMAIL AGAIN, THANKS! PLEASE NOTE: The email was in regards to filling out a form. The form allowed you to make a choice involving your GoG credits. If you didn't receive that email, please check your spam folder first, if it’s not there, then message us here on Kickstarter so we can verify you are at the $50 or above level. Please do not message in the comments of Kickstarter. It is best to message us directly on Kickstarter so we can verify your backer level. If you have already contacted us about this, please be patient and we'll get back to you soon. Most of you who have filled out the form have received your credits, however If you have already filled out the form and are still waiting, please continue to be patient, it's on the way! When will our rewards be shipped? Answer: As soon as the game is complete, we’ll be shipping rewards out. My address has changed and I need to update it with you guys. How do I do that? Answer: Don’t worry about giving us your updated address right now. When we get ready to ship the items, we are gonna request you all to give us your updated address so we will all be in sync. No point in getting that as of now, because some of you may move between now and then. Which conventions will you guys be at? Answer: The Two guys Mark Crowe, Scott Murphy, and the SpacePope Chris Pope will all three be at SDCC 2013(San Diego) and possibly GMX 2013(Nashville). We were all hoping to be at PAX Seattle as well, but that may not happen. You guys sure have been going to a lot of conventions. Shouldn’t you be making a game? Answer: Actually Chris Pope is the one that has been going to conventions, and that has been on his own dime, not the company’s. Mark and Scott have only been to one convention so far and that was GMX 2012. GMX paid for the entire thing. Do you love us backers? Answer: We love you more than Orats love chasing Sarien Spider Droids! We love you more than Labion Terror Beasts love Cubix Rubes! We love you more than Fester Blatz loves ear wax! We love you more than Sequel Police love dressing in black! We love you more than... oh you get the picture! 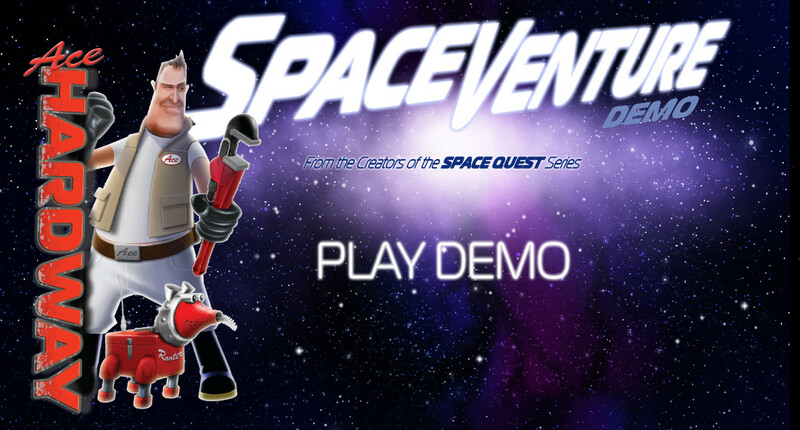 Anyone and everyone that will be at San Diego Comicon, please come by and meet up with us to get a live demonstration of the SpaceVenture playable demo. 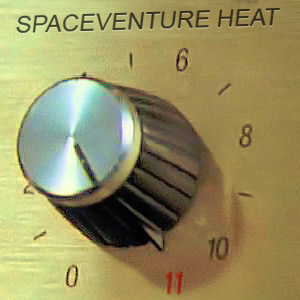 Mark Crowe, Scott Murphy, and Chris Pope will all be there showing off a taste of what to expect in SpaceVenture. 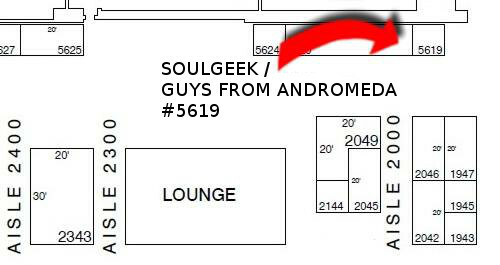 We'll let everyone know what table number we'll be at as soon as we have that from Comicon.